You will definitely enjoy a relaxing and quiet getaway in this remodeled and cozy cabin! 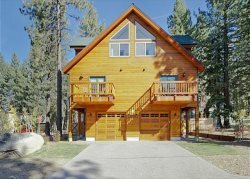 With new furnishings and appliances throughout, this cabin has the old Tahoe cabin charm with modern conveniences. Conveniently located in town, you will be minutes away from any activity you would like to do during your stay.